Ultra-Classy, yet with a daring sassy edge, this Pagasus Filigree Mask - Limited Nero Black is a must-have for setting the trends this year. A fashion-forward design in stunning nero black laser cut metal paintwork which is formed in to the shape of the winged horse Peagasus and adorned with authentic Swarovski crystals. 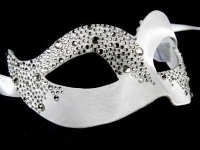 Precision cut to provide a most elegant design so toughen up your look & add designer chic to your wardrobe with this filigree mask for men or women.